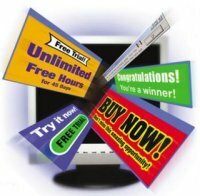 Any bit of marketing or advertising that you do is an attempt to gain attention from consumers. Show me something that people are doing, and I’ll show you the marketers that are attempting to push a message to them. The trick is, can you get the message in front of the consumer in a way that A) does not feel like an ad, B) feels like an ad but is so relevant that it doesn’t matter, or C) is so non-invasive that if it’s not relevant it does not piss people off? Assuming you can’t do A and B, let’s take a closer look at C. Being invasive means getting in the way. Having to sit through a 30 second promo to watch a video on YouTube is invasive. Commercials on TV are invasive. Pop-ups are invasive. People don’t like them. They may work, but they also piss people off if they’re not done well. A study recently published says that 58% of consumers think that brand messages on social networks are invasive. 64% of people surveyed said they “hate” messages from companies on social networks. That’s higher than a lot of people in the marketing world would expect. But remember, social networks are still relatively new, and pure. Last week I taught a class on email marketing and there was a great question from one of the students on the effectiveness of email vs. brand messaging on social networks. We came to the conclusion that while both are forms of advertising, and there are companies that do one better than the other, in general people are on social networks to interact with each other and not companies. Meanwhile, 94% of email users actively subscribe to at least one companies’ email list. So ads and messaging on social networks are seen as more invasive than email, overall. One final warning: most marketers don’t think what they’re doing is invasive. Consumers might think otherwise. Find out before you abuse your right to message people.